Sports hatred, when directed en masse at a particular team, is rarely based on that team’s style of play. The Yankees hit a lot of fan-friendly home runs. Kobe Bryant’s appealing electricity was the engine of the recent Lakers’ titles. The Cowboys of Aikman, Irving, and Smith were high-scoring and never dull. And Duke — the most polarizing team in college basketball — is no exception. In good times and bad, regardless of how the season ends, the Blue Devils have some of the most dynamic guards in the country. I would argue that elite guard play is the most entertaining aspect of basketball. People want fast breaks, people want 3-pointers, people want dunks, people want great passes, and people want dribbling theatrics. All of these are provided by guards and small forwards, while only two elements — the dunk and the occasional pass — generally result from post play. Unsympathetic fans will reel off a litany of reasons for hating Duke, but the word “boring” is never among the gripes. The lineage of great Blue Devil guards — from Johnny Dawkins to Tommy Amaker to Bobby Hurley to Trajan Langdon to Jay Williams to Chris Duhon to J.J. Redick to Nolan Smith to present — have provided years of quick, fluid basketball. Sure, there have been some excellent big men at Duke, but there have also been some not-so-excellent ones, and the legacy of the program will always begin and end with the guards. Why are they so good? Is it the players, or is it the system? In Austin Rivers’ case, it’s certainly a combination. The freshman phenom came in with enough talent to be considered the top shooting guard recruit in the country, and some suspect he could be a lottery pick as early as next year. But as Sebastian Pruiti pointed out earlier this week, he struggled to adapt to the rigors of the college game at the start of the season. Often, he’d beat his man off the dribble only to charge head-long into the lane, forcing shots, getting suckered into charges, and missing open teammates. Over the last two nights in Maui, though, in wins against Tennessee and Michigan (Duke plays in the Maui title game Wednesday against Kansas), we’ve witnessed the ascent of Austin Rivers. He’s starting to recognize a stationary defender and avoid the charge, and he’s spotting teammates from the lane. In the second half Tuesday night, he beat his defender, took two steps toward the basket, and hit Seth Curry outside for an open 3 in the midst of a Duke run. It’s a pass he wouldn’t have made even 10 days ago, but it already feels like it’s becoming second nature. In fact, he’s yet to commit a single offensive foul in Maui, despite tallying season highs with 18 and 20 points. This increased system awareness has improved his individual game, which is a message many Duke fans were afraid it would take Rivers too long to digest. His aggression on the drive is more intimidating when opponents know the pass is an option, and the increased fear of his quickness has opened up the possibility of his lethal step-back 3. Rivers’ fast adaptation has transformed Duke from a team that nearly lost at home to Belmont to a team that dominates ranked opponents. And it’s all happened in just two weeks. Then there’s Curry, the steady, quiet presence who rarely seems miss a big shot. Actually, he’s not missing many shots at all this season. His 6-of-7 performance against Michigan, including 3-of-3 from beyond the arc, upped his shooting percentage to .556 on the year, and .583 from long range. He and Rivers share the point, and so far it seems like a happy partnership. Curry transferred from Liberty three years ago, and fell easily into Duke’s system after sitting out the championship season. Now, asked to carry more responsibility in the absence of Nolan Smith, he’s averaging 16 points per game and proving his competence at the point against strong opposition. The other prominent guard is Andre Dawkins, whose reputation for erratic play, highlighted by long periods of inactivity, is beginning to vanish. He’s been nothing but reliable this season; a late 3-pointer against Belmont and 26 points against Michigan State saved Duke from an early upset while the team found its feet. And despite the trademark Rivers snarl, which seems more and more like a defensive affectation rather than a reflection of character, Dawkins is the fiercest player on the team. There’s a sense of anger about him that’s usually funneled into a useful competitive drive. The individual skill of all three can be a joy to watch, and the display was spectacular against Michigan. Add in Ryan Kelly, the 6-foot-11 forward with great range who plays more like a guard, and the quartet scored 68 points and shot 11-of-21 from 3-point range. It’s a tribute to talent, of course, but let’s give Coach K’s system its due. Last year, in the second round of the NCAA (or “third round,” by the new jargon), Michigan gave Duke a bit of trouble with a 1-3-1 zone defense that would spring up by surprise. In their first round win against no. 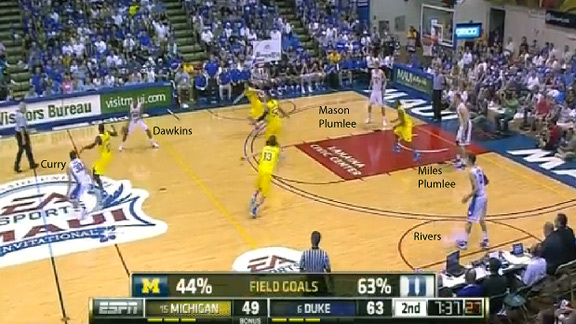 8 Memphis, the Wolverines confounded their opponent with the same tactic. 1. Bringing the ball upcourt shortly after a TV timeout, Curry immediately recognizes the zone. As the top defender of the 1-3-1 approaches, he passes left to Dawkins to take the pressure off the middle. 2. 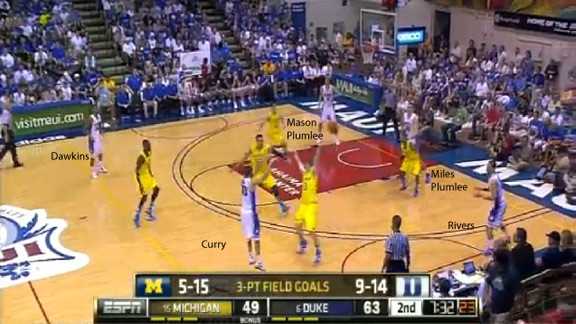 Immediately after passing, Curry distances himself from Dawkins, moving to the far right. Dawkins knew the double team was coming, lets the defense get close, and passes back to Curry, creating a slight advantage for Duke. 3. The signature of the 1-3-1 is that a double team is always coming, making the quick pass a necessity. Curry hits Rivers in the corner as Miles Plumlee allows the interior defender around him. 4. 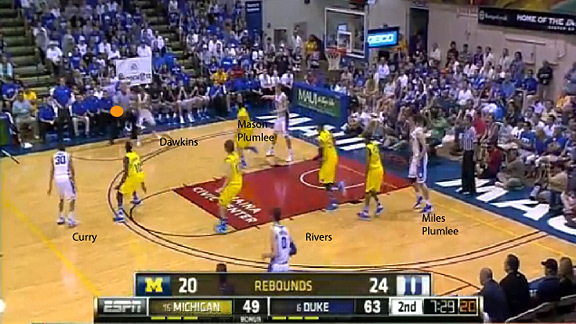 Without waiting, Rivers makes the quick pass to Miles Plumlee in the post. As it happens, Curry floats back to the center, an example of the constant movement needed to create the proper spacing. This is the key moment in the sequence, when the team’s guard-first mentality comes into play. A typical big man might receive that pass and try a quick move before the double comes, but Duke’s are trained to exploit an advantage that might free up a guard. 5. 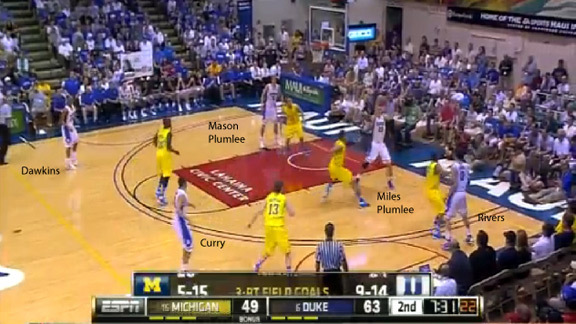 Plumlee makes the terrific long pass to Curry (I included a visual aid here. The ball didn’t suddenly turn fluorescent), who has moved to the top of the key, and now the 1-3-1 defense is officially out of sorts. Here, the front man has to make a choice. Either he rushes out to meet Curry, or he tries to anticipate the pass to Dawkins. Either way, an open 3-pointer from a great shooter is imminent. 6. Curry is rushed, and makes the immediate pass to Dawkins. 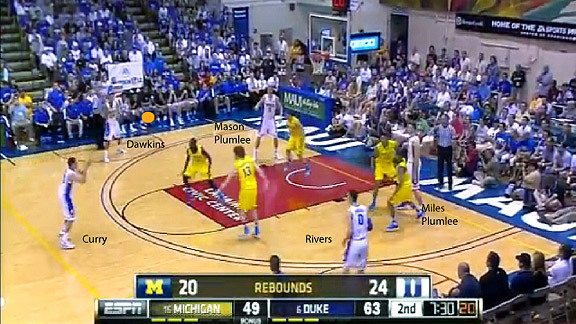 One of Duke’s best 3-point shooters is now unguarded with the ball on the perimeter. There are a few things to consider here. First, it’s remarkable that Coach K has his relatively young team capable of this advanced efficiency, especially because he only had a night to prepare for Michigan. 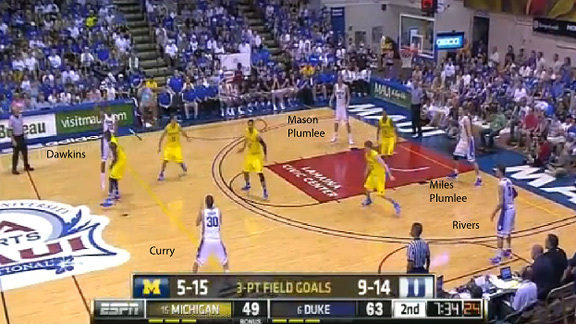 Second, the whole play, comprising six passes between four players, took just nine seconds. You might not see a better zone break-down all season, and that’s a product of the system. And yet, the system isn’t everything. 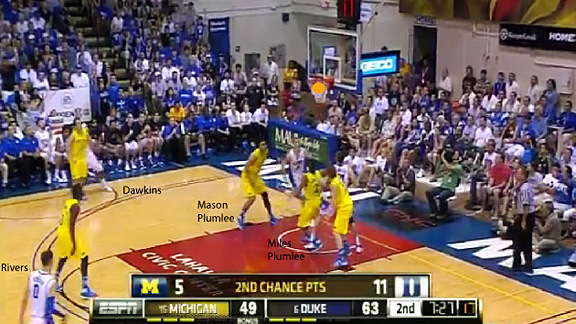 The passes had to be perfect, and Dawkins had to nail the shot. The beautiful sequence was a synthesis of talent and coaching — a combination that’s produced 25 years of thrilling guard play, and shows no signs of abating.